Coil-Over System | 710F: Shocks shown may differ from base kit. *IMPORTANT*: GM is producing several knuckle/control arm configurations in 2014-2017 models trucks. Cast Steel control arm equipped models will require the "Cast Steel Control Arm" kit. Stamped Steel and Aluminum control arm equipped models will require the "Aluminum Control Arm" kit. Be sure to verify which factory control arms your truck has before ordering by referecing our help images when customizing your kit. 4. 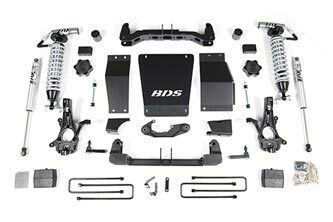 Vehicles came from the factory with several knuckle/control arm configurations requiring specific kit selections. Be sure to reference the important notes and images above to determine the correct control arm selection for your application. 7. If choosing the 5" rear block option, add-a-leaf # 111209 is recommended for a more level/tail high stance on crew cab models. 8. IMPORTANT! 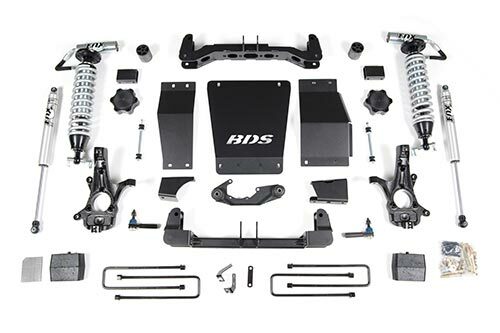 When selecting Upper Control Arms - For 14-18 year models, this kit will ONLY work on vehicles with OE Cast Steel Arms.